Sync gives you the ability to share After Effects Project files without duplicating content. Increase your productivity, start Syncing your files today. How it works. Examples of usage. With Project Sync 3 there are now 2 different options for syncing your projects. You will use this option if you have already imported a project into your working project and want to watch it for updates. Simply select the Imported Project's folder in the project panel. Click “Link Project” in your Project Sync panel. Locate the .AEP that you imported and click “open”. That's it! Your Project should now be displayed in the “Linked Projects” list in the Project Sync panel. To check for updates, use the “Check for Updates” button. You will use this option if you have a comp that you would like to export to another user. Simply select the comp that you'd like to share in the project panel. Click “Share Comp” in your Project Sync panel. Click “ok” to save the current project. You will now enter a name for the new project that has been created from your comp. By default it will be the same name as the selected Composition. Once you've saved this new project, it will be imported into your project and replace the original comp. That's it! Your Project should now be displayed in the “Linked Projects” list in the Project Sync panel. You can check for updates with the “Check for Updates” button. 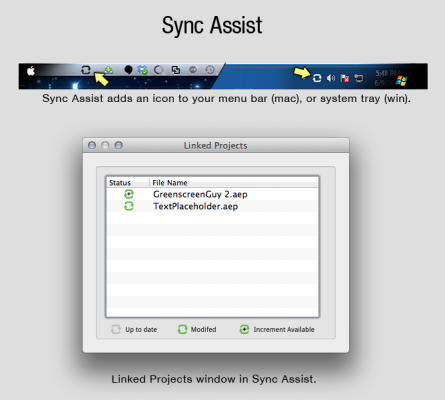 Sync Assist is an optional external application that can be used with Project Sync 3. It provides realtime notifications to users when a watched file has been updated or a file increment has been discovered. Upgrade Notice: If you previously purchased AE Project Sync you can upgrade to this version for free. Simply login to your account. Updated compatibility for CC 2014.